Are You Too Old to Learn a Foreign Language? There are many publications and studies that argue that the absolute prime time to embark on the path to learning a foreign language is when you are young. Some experts even try to say that the optimal time for someone to start learning a second language is before the age of kindergarten. However, for most people who never actually learned a foreign language, that timeframe has long since passed. 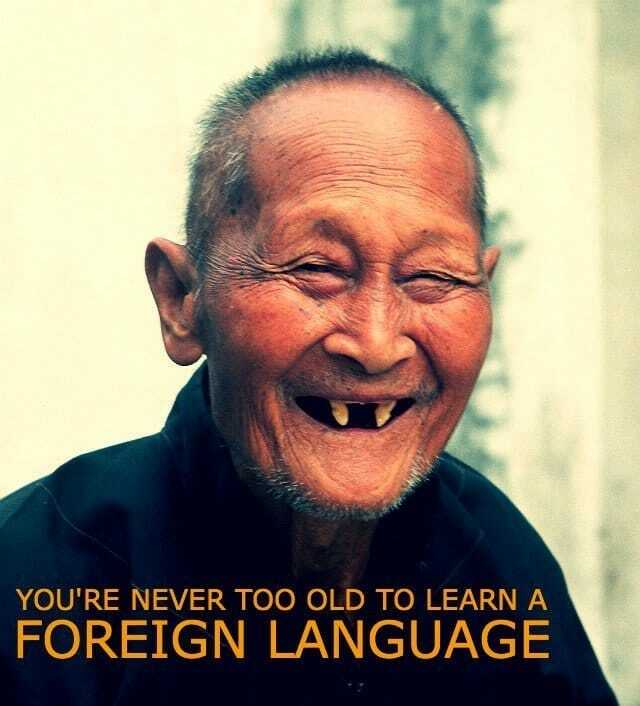 There really is no such thing as being too old to learn a foreign language. You simply have to have a good starting point and the right mindset. Starting off with a keen and genuine interest in the target language and culture is perhaps the most important foundation on which to build your language learning experience. A positive mindset from the outset will determine the degree of your success or failure – whatever your natural ability or age. The worst possible thing you can do is to sit back and tell yourself that you are too old. This negative mindset will actually work against you and hinder your chances of successfully learning the foreign language of your choosing. You have to give yourself an internal pep talk and remind yourself that you are just as capable as anyone else and try to turn any negative inner speech patterns into positive ones. on any new foreign language. Decide on a learning method that is right for YOU! It is also important to think carefully about the correct learning method for you, personally. Perhaps, look back on a time when you were successful in learning something new and try to analyse the key ingredients that helped you succeed at that time. Maybe it was having a really inspirational teacher that was the key to your success? Perhaps you had plenty of stress free time on your hands to dedicate to your studies? Did you enjoy having a friendly and supportive group of classmates who helped to keep you motivated? Maybe you felt relaxed, encouraged and inspired in that environment and that was why you were so successful in your studies at that time. If that was the case, then make sure you try to emulate that experience when deciding how you are going to learn a foreign language. Decide what will be the best learning method for YOU? There are many online language learning resources and ‘teach yourself’ books, CD’s, DVD’s and audio recordings, some of them are very good (some not so good), but if your successful learning experience was anything like the example above, don’t be swayed into thinking that an online language learning course, for example, is the right thing for you. Sitting for hours on end alone at your computer will probably not bring out the best in you. Yes, you will learn something but are you likely to stick with it? Is that the style of learning what inspires and motivates you the most? Likewise, squeezing in a bit of time during your 60 hour, highly stressful working week to study a ‘learn Chinese in 60 days’ book will most likely lead to failure. If your successful learning experience was anything like the one described above, it suggests that you are a person who thrives on personal contact and ongoing support and excels in a relatively stress free environment. Therefore, conclude that trying to learn a foreign language online or with a ‘teach yourself’ book is not the best option for you. You should, perhaps, find a good language training school, with excellent teachers and supportive classmates to bring out the best in you. The point is, we all know what works best for us as individuals and we should strive to match our preferred learning styles with specific learning methods. If you hate the idea of one-on-one language lessons, join a group class. If you’ve tried and failed by listening to audio recordings and teach yourself language books, then consider a personal language tutor or a group class. Similarly, if you hate group classes, enjoy computers, love the Internet and work best on your own, then perhaps an online language course is the way ahead for you. 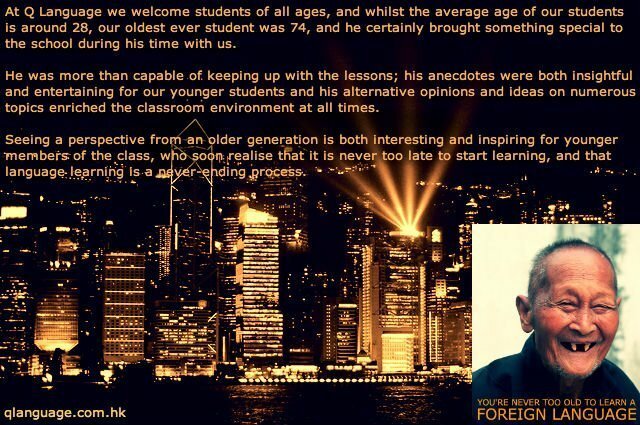 At Q Language we welcome students of all ages, and whilst the average age of our students is around 28, our oldest ever student was 74, and he certainly brought something special to the school during his time studying with us. He was more than capable of keeping up with the lessons; his anecdotes were both insightful and entertaining for our younger students and his alternative opinions and ideas on numerous topics enriched the classroom environment at all times. that age should never be a factor that holds you back. Seeing a perspective from an older generation is both interesting and inspiring for younger members of the class, who soon realise that it is never too late to start learning and that language learning is a never-ending process. You can keep your brain sharp and learn a foreign language at any time of your life as long as you adopt the right mindset and be mindful of your preferred learning style and the learning environment that is best suited to you as an individual. Remember, also, that foreign language learning opens up new experiences, new cultures, new travel opportunities and the chance to make many new friends. Tell yourself, you are never too old! For further interesting reading on this subject you should take a look at Benny Lewis’ Fluentin3months website. His article Why Adult’s Are Better Learners Than Kids – So No You’re Not Too Old discusses why scientific studies are often “biased and ultimately useless”, inappropriate learning strategies for adult learners, adult vs babies, adults vs kids and why he believes that you are never too old to learn a foreign language. And for a taster of Benny’s inspirational journey to becoming a renowned polyglot, watch this short video presentation. I want my mother to learn Mandarin. She is 69 so she will be happy to know that she won’t be the oldest! Hola, quiero ir a estudiar inglés y chino mandarín con ustedes, como tengo que hacer?